This is the wish made by Greek Prime Minister Alexis Tsipras, who was officially visiting Turkey after he visited the Orthodox Halki Seminary as part of his İstanbul visit. Tsipras is the first Greek prime minister in history to visit the Orthodox Halki Seminary in İstanbul’s Heybeliada. Heybeliada is the second largest of the Prince Islands in the Sea of Marmara, Halki was the ancient name of the İsland in the Byzantium period. Along with his delegation, Tsipras arrived in İstanbul on Wednesday morning. 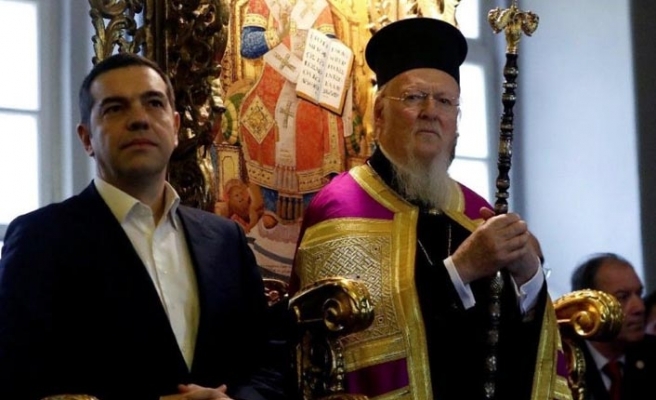 At the İstanbul leg of his official visit, Tsipras went to Orthodox Halki Seminary where he was accompanied by Fener Greek Patriarch Bartholomew and Turkish Presidential spokesman İbrahim Kalın. Tsipras, Bartholomew and Kalın planted a plane tree in Halki Seminary’s garden. “Monotheistic religions should not discriminate but rather unify. It is regrettable both the Greek minority here had suffered when they perform their religious practices like the Muslim minority in Western Thrace. Today we observe an improvement. In modern democracies, concepts such as respecting human rights are important. “We have been expecting our positive dialogues in recent years will bear fruit. I wish minority rights to be preserved reciprocally both by Turkish and Greek minorities, who live in Turkey and Greece,” added Tsipras. The Halki Seminary (Ruhban Okulu in Turkish), once the main school of theology of the Eastern Orthodox Church’s Ecumenical Patriarchate of Constantinople, has been closed since 1971 when the Turkish Parliament banned private higher education institutions. And so, like a museum, it remains, frozen in a particular section of time and perched above Heybeliada like a brilliant secret among the green rush of trees. Appropriately named the Hill of Hope, the U-shaped monastery also houses a 17th-century chapel, Aya Triada (The Chapel of the Holy Trinity) in the middle, which holds a unique icon depicting Christ embracing his mother the Virgin Mary. The icon, more than 150 years old, was discovered to be double-sided during restorations and is believed to fulfil the wishes of the devout, who hang rings and small plates of silver around its frame.